When you’re in Mykonos, there’s no shortage of things to do. There are beaches to explore, history to see, amazing food to eat, and shopping to do. But when you crave a quieter experience, taking a side-trip to the island of Rhenia is a good choice. If you prefer to go without a guide, you can rent a boat. You can also choose from private and shared cruises. Cruises can range from a few hours to a full day depending on your preference. 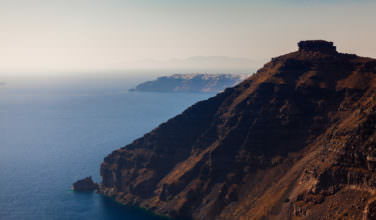 The island was first inhabited approximately 7,000 years ago. Rhenia island is also known as “Big Delos” and “Great Delos” as it is four times the size of its sister, Delos island. Rhenia island is a protected archaeological site. The island is the ancient burial ground of warriors who died on Delos. You can still see grave markers and burial stones throughout the rocky terrain. In 523 BC, the tyrant of Samos island, Polikratis, dedicated Rhenia island to the god Apollo. 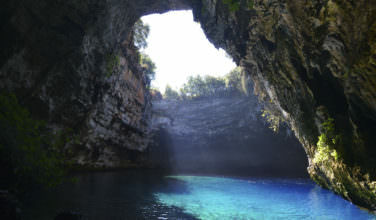 Between 1898 and 1900 the “purification pit” was discovered by Greek archaeologist Dimitris Stavrolopoulos. It contained hundreds of vessels of offerings such as ivory, marble, and glass as well as urns with ashes of bodies. There is no running water, electricity, or telephones on the island. Limited farming and grazing are allowed on both Rhenia and Delos for a fee, but no one is legally allowed to live there or build on the island. There are four sandy beaches on Rhenia island: Glyfada, Stena, Lia, and Ambelia. These beaches are protected by two coves. Rhenia island and Delos island are separated by a small straight. The sea water is a beautiful blue-green color, which changes as you approach the shore to crystal clear. 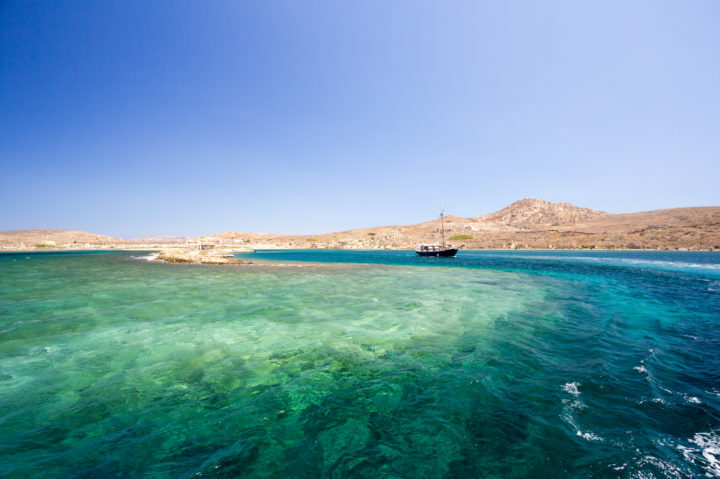 You can visit the beaches via rented boat or take tour cruise that combines with a visit to Delos island and stops at a beach area at Rhenia island to allow for swimming and exploring. You can also choose to do a sail yacht cruise directly to Rhenia island. You will be treated to a meal and drinks during these organized cruises. You can even go snorkeling in the Aegean Sea. It’s an experience you don’t want to miss out on. 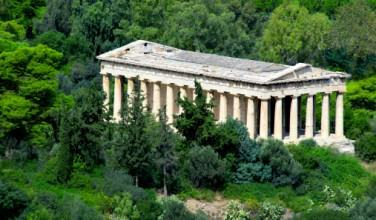 You will probably want to walk around the island and explore the ancient temples. Don’t forget your camera! The photo opportunities you’ll have are unlike anything else. Because the island is not often visited by scores of tourists, you can expect to be one of very few, if not the only, visitors. Visiting the island of Rhenia is an experience you won’t regret, especially if you’re fascinated by history that is . The beauty of the island and surrounding area alone make the trip worth taking.